Jack Butala: Welcome to Land Academy. You are not alone in your real estate ambition. Seven days a week. I’m your host Jack Butala. Jack Butala: Super successful Seth Williams tells us it only takes a teaspoon full of effort to buy a good property. We are the experts in the land flipping business. Jill Dewit: Steven and I interview successful and newbies alike all in the name of helping you succeed. Jack Butala: Have you read my free eBook? It’s free. Go to landacademy.com. Have some questions, want to be on the air? Jack Butala: Every single month we give away a free property for free, no strings. It’s a simple two step process to qualify. One, leave us your feedback for this podcast on iTunes, and two, get a free eBook at landacademy.com. Jill Dewit: Let’s get this thing started. Jack Butala: Seth Williams is an experienced land investor, commercial real estate banker, and residential income property owner. He is also the founder of retipster.com, a real estate investing blog, providing real guidance for part-time real estate investors. Seth, it is always great to have you on the show. I’m super excited today. It’s our new show. Jill’s with us also. Jack Butala: It’s wonderful to have you because you are probably the only person that we’ve had on the show or that I know of where we have really similar business models. I think we’ve gotten to the place where we are in a really different way, but I think it’s a treat for our listeners because it’s important to talk a little bit about where we’ve gotten, and how we do things on a day to day basis. It’s great to have you man. Seth Williams: Absolutely. Thanks for helping me out Steve. Glad to be here. 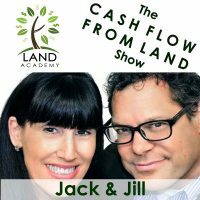 Jack Butala: Tell us who you are in the land flipping industry, and kind of explain or re-explain the niche that you and I share. Seth Williams: I’ve been working as a land investor for probably seven-ish years now. I’ve really just be doing it kind of on a part-time basis. I’m a regular person with a full-time job, and all that. I’ve doing this since about 2008. I stumbled across it after trying to do things the way that everybody else was doing it, just looking for houses and trying to flip houses and that kind of thing. Everything I would look at on the MLS, it would never make sense. The numbers would just never add up, and I was just like banging my head against the wall trying to figure out, how does anybody do this? I don’t get it. I don’t want to risk my life savings to buy a property that just into a disaster, and I lose everything. I couldn’t make it work. When I finally discovered the land investing niche, it was just like, man, this is just everything that I’ve needed in a real estate investing niche. I couldn’t believe that more people hadn’t jumped on board, and started doing the same kind of thing because it just made a lot of sense from a lot of different angles. I’ve just being buying properties, and typically the people that I have been trying to focus on have been people who were delinquent on their property taxes. I think you guys probably do that to some extent, but I think you guys do a little bit differently. Is that right? Seth Williams: I guess it just goes to show there is a lot of different ways to skin a cow when it comes to this. It’s been really, really an effective way to buy properties for pennies on the dollar. It involves very little risk on the investor’s end, and you can turn around and sell usually relatively quickly. It’s been a really good way for me to make money on real estate. Jack Butala: Excellent. Right before I got on the call with you, I was reviewing the comments on our blog, on the website, on the land academy website. Somebody just said in there, I had no idea. I had no idea that this existed. Almost a slightly different version of what you just said. I’ve been trying to flip houses, and it costs money. I’ve been trying to search money, and do all the stuff all at once. I had no idea you could flip land like that. It so much cheaper. I know I’ve said this a million times, it’s one of the biggest issues that we have, is having people say, we just don’t believe you. Seth Williams: I’ve heard the same thing on a number of occasions. It’s kind of thing where it’s like, I don’t know. It’s too bad for them, but it’s true. We’ve been doing it. We’ve got plenty examples of other people who have done it where they are just sort of paid attention, and implemented the advice, and it works. It just a matter of having some faith in the process, and being willing to get your feet wet. Jack Butala: Who are you? Tell us a little bit about retipster. It’s picked up a huge amount of steam. You are the organic search guru. That’s what I call you around the office. I don’t know how you drive you traffic the way that you do without spending any money. I’m in awe. I mean it. Seth Williams: Thank you. I appreciate that. It’s taken a lot of work, but really the premise behind the blog is kind of born out of my own struggles, and frustrations with trying to figure out real estate investing in the beginning. Just finding the land investing niche by itself took a lot of work, and a little bit of luck just to like even know about it. Then once I knew about it, and got started, that ended this whole realm of all these other new questions. How do I get past this obstacle, and how do I do that? There were a lot of questions I had in the beginning, a lot of places where I got stuck and almost kind of felt hopeless. It was just a matter of continuing to pursue and just push through those obstacles. Really what my goal has been for the blog is just to create a resource that explains a lot of those problems to people, and how I was able to maneuver through them. It’s not necessarily that my way is like the only way, or the number right way, it’s the way it made sense to me, and the way that it worked. I think it’s kind of thing where a lot of investors just aren’t out there. I’m trying to give people some options so that if somebody is Googling, how do I value this piece of land? What’s a perk test? How do I do that? All these random things that you come up in the land investing business, and there are just not good answers, I’m trying to offer that to the world. Jack Butala: Again, that’s a similarity between the entity that you have, and the one that you and I have. We started Land Academy to answer those questions. It ultimately led to over a lot of years. I’ve been in this since the nineties. I have students for as long back as I can remember, members/students, but only recently did we release this education comprehensive package where I try to answer just about all those questions or at least the beginner questions in one single place kind of thing. Seth Williams: You guys are both great writers by the way. I’ve read both of your writing posts out there. Everything I’m like, this is good stuff. I hope you keep doing it. Jack Butala: Thank you Seth. I appreciate that. Jill is a really good writer. She writes all my stuff, and I put my name on the bottom of it. Seth Williams: Is that how it works? Jill Dewit: No, but I might proof a few of them. Leave at that. Seth Williams: You can never get enough proofreading. I know. It’s actually one thing I’ve noticed in some blog posts of mine that I guess have gotten the most traction. I’ve come back to them at least a dozen times over the years and just re-read them, and went, that doesn’t sound right and just tweaked them a little bit, and that can go a long way just in terms being more readable and easily relatable to people, and all that. Jack Butala: If you had to explain our niche in like, I don’t know, two or three sentences, what would you say? Seth Williams: Like a tagline font or something? Jack Butala: Sure, whatever you think. Like, buy low sell high, or I don’t know. Seth Williams: I guess I hadn’t really thought that at a time. I might say it just a really low risk way of getting access to real good opportunities that most of the world doesn’t know about, and will never know about because they are not looking in the right places. That kind of thing, that was really what just shocked me the most at first, was like, I can’t believe it’s even possible to get these kind of deals. I can’t believe it’s even out there, and there is not like tens of thousands of other people all over these things. I just kind of felt like I had this secret access to this treasure trove of information. In a sense you do. It’s just a matter of seeing the opportunity, pursuing it when nobody else does. Jack Butala: Exactly. Well said. This is how explained it to somebody recently, because they kept pushing me for a better answer. I said, look, we source and buy properties for a thousand bucks or less, and well sell for three or four thousand dollars pretty quickly, usually immediately. We do it a lot many, many times every week. That seemed to sink in with that person. It’s just like a third grade level of description of what we do. Is that about what you guys do, or is it a little bit different than that? Seth Williams: No. That sounds pretty much in line. I’ll agree. Jill Dewit: What I think is interesting about all of our niche is that so many people don’t understand that just because it’s unimproved doesn’t mean there is no value. It comes up a lot. I hear people that they think, but then I have to do something with it. No, you don’t. You don’t have to put anything on it. You could still money off of it. Jack Butala: You just have to find it. That’s the value that I really think we’re bringing. Seth Williams: When you think about it’s all about the margin. It’s just like buying really anything of value, whether it’d be a car, or a piece of jewelry or whatever. If you could get that for like pennies on the dollar then yeah, there is automatic built in value, whatever it is. That’s kind of what land is. Doesn’t mean you have to do anything, just means you got the best possible price. Jack Butala: I’ve always it’s some version of this, a good acquisitions program solves all sales issues. If you a buy property for less than half of what it’s worth you’re going to do fine. Seth Williams: Absolutely. It’s not hard to sell those. Jack Butala: Seth, what makes you the expert? You have a very large following. Like I said earlier, your name comes up all the time, and people see you as an expert. What do you think? Seth Williams: I don’t know. I guess it just depends on what you can an expert. I wouldn’t see myself as like this all-knowing person who has all the answers to the world’s problems or anything like that. I think it’s really just maybe that I’ve just kind of stuck with it over the years. There is lots of other stuff that can get in somebody’s way and kind of bring them off course and pull them off truck. I just landed, sort of always been just a really obvious, bery sensible strategy in terms of the opportunity there and I have just kept doing it. Through doing that you’re going to learn a lot of stuff in that process. I’ve been through a lot of the struggles and made a lot of the dumb mistakes. Everything a beginner could possibly go through, I’ve seen just about all that andI think if anything maybe it’s like my empathy. I know what it’s like to hurt and suffer in that realm. I don’t want people to have to do that if they don’t have it so I’m trying to make it easier for people in any way I can. Jill Dewit: I love that we’ve all made some really dumb mistakes in this, and that’s okay. We won’t do that again. It’s going to happen. I’m with you, that’s like with our program. We thought we are trying to help you like in your thing. Our program, we try to lay a good foundation of all the things, and to help them along every little piece of, if you want to have this business or you want to buy a property. We can save them sometime. Steve and I are often joked, boy if this was available to us back then. Can you imagine Seth? If you were available to you ten years ago, wouldn’t that have been great? Seth Williams: Yeah. I’m don’t want to brag but that would be amazing if I was available to me. I totally agree. Actually I saw a quote on that not long ago. It said, you want to know the difference between a master and a beginner, the master has failed more times than the beginner. Seth Williams: It’s like, yeah. Pretty much. Well said. Jack Butala: What deals are you working on right now? Give us a little taste. Seth Williams: I guess it just depends on how you define a deal. I own about four right now. I’ve got two that are on seller-financed notes. I’m usually in some form of negotiation on like four or five at any given time. In terms of like leads that are just coming on the door, there’s usually at least like a dozen that are on the table. I’ve learned and I think you guys have probably learned too it’s pretty crucial to have more leads than you can handle, just like lots of people who want what you have to offer, because it allows you to, you don’t have to take something out of desperation. It’s more of like, oh yeah. That makes perfect sense for me. I’ll do that. Jack Butala: A lot of it’s a numbers game, but some of it is how you handle what come in too. You could have a hundred deals come in and twenty of them are fantastic, but you’re concentrating on the other six that don’t make sense. There is a such a balance or finance to it, don’t you think? Seth Williams: Absolutely. The way that a lot of my deals are coming in these days are through my website, like I said, almost all of them now. I used to rely really heavily on direct mail, and I still do when I’m trying to target a specific area just because that kind of gives me a lot of control from that standpoint. There is just so much stuff coming in from the website. It’s kind of hard to work hard at other ways when I just have this built in funnel already. Jack Butala: Who do you distribute it to? Is it organic? What do you attribute the traffic to that website to? Seth Williams: I’ve waited a lot longer than I should have to get my website up and running. I was probably in business for like three or almost four years until I really did that just on terms of the acquisitions side of it. Back when I did it, I actually paid somebody to do some search engine optimization for me. This was back in 2011 I think when that kind of thing still was pretty effective. You could gain the system and they could work that way. I think it can still work a little bit, but it’s not nearly what it used to be. That I was kind of how my original streams of traffic started coming in back in the day. I don’t why, it’s maybe tapered off a little, but it’s still there. I don’t know if people are bookmarking it or something, or what, I don’t know but I’m still getting plenty of traffic. Jack Butala: I think that you probably did whatever you were supposed to do back then, and then Google said, yes, and now you’re reaping the benefits from that. I had a very lengthy conference call with an organic SEO expert and they said it takes probably around twenty four months if you’re doing everything right to really get some good traffic organically. You started before Google Analytics and all that probably, right? Seth Williams: I think Google Analytics was still around. I will say when I had actually paid the money to get the SEO work, even then it was like six months or so when [crosstalk 00:16:45] really started happening. It wasn’t like I did it, and then the next day it was working. Even back in those days, it took some patience. It wasn’t just immediate results. I think today it takes a lot more maybe diversified strategy than just that. It’s a lot of creating content that people actually want to see. I think I heard from one SEO website, Google has something like two hundred different metrics that they look at. Jack Butala: I read that too. Seth Williams: There is a lot of different, it’s not like just putting a video on the page is going to make it all better. There is a lot of different things that have to be done at least reasonably well. Jack Butala: I read that if you type something in like cheap land in Google, it runs around two hundred algorithms to make sense of that for what they think you want that to be. A lot of it has to do with geography, your personal geography. Seth Williams: That would make sense. Jack Butala: It’s complicated. We rely on very well placed consistent direct mail campaigns. I’ve fine tune it over the years, and we talk about this on our programs all throughout. We send actual offers with a number in the offer to see if the person wants to sell. We kind of cut to the chase, and I try to cut out the amount of ineffective responses that we get. That seems to be working well. Jill, back me up on this. We get multiple calls a day from mailers that we’ve sent out in the mid 200’s. Jill Dewit: I love it. It’s hilarious. Jill Dewit: Isn’t it? I’ve had people say, I’m sorry. It took me so long to get back to you. It’s like eight years old. It was little old lady, and it was the cutest thing. She said, If this is still kind of on the table, I promise my response won’t take this long. She was so cute. I have a question Seth, on your buying criteria. It sounds like you’re picky, and I appreciate that andour portfolio is [inaudible 00:18:56] growing. What do you look for? Are you a big acreage? Are you anything, and everything? What’s your thing? Seth Williams: It’s a good question. I would say for the most part, I don’t know if I’ve actually drilled it down that specific adn clearly, and just laid that out, but it’s typically stuff that would be within a price range where I’ve got the cash and I can buy it. I try to focus on states where I have worked before, just places where I understand the rules and the finer details of the law in those states. If it’s a huge attractive land at a price I can afford, then yeah, absolutely, I’ll get that. I’ve actually tried a little bit in recent years getting more into the wholesaling aspect of it, like just getting a contract and selling the contract to people. That’s been interesting just in terms of the different pros and cons that come along with that. Have you every guys tried that? Doing the signing contract? Jack Butala: Yeah. We call it optioning. There is a whole section in our initial education program about optioning which I think is the …. Jack Butala: Everybody has got a different phrase for it, but I think what it is, is the original no down, no cost approach to it doing a real estate deal. Some people call it wholesaling. We call it optioning. Jill, you want to explain it? Jill Dewit: Sure. Someone will come to me with a property, and call it what you’re talking about. If have the cash and it’s a great deal I’m going to buy it. Sometimes I just want to build up my inventory or just see how it’s going to work. I will send out kind of a contract option agreement. We know what their target price is, and we all agree on that. It’s going to be ninety days or whatever, and then I’m going to go market it. It often works. I usually don’t take them on unless I really feel good that it’s going to happen. I pretty much have one of my buyers in my back pocket anyway that I know that this is perfect for this guy, this is all his stuff so it’s perfect. It usually goes pretty fast where I’ll just send them the agreement, and they’ll say, yea and I’ll call my guy, and I’ll negotiate the deal, and then he sends me a check basically. I try and cash that check, buy her thing, and then deed gets passed on through the system. It’s really easy, and I love those. Jack Butala: We just did an option. I’m sorry, go ahead. Seth Williams: I was just going to ask, do you focus on like a few specific states, or is it kind of like whatever? I don’t care where it comes from or … ? Seth Williams: I guess you’re still targeting them because you got the direct mail thing? You can get to choose where the leads are coming from. Jill Dewit: I never say no. I’m the one usually, Seth, that answers the calls when they come in, and there is no property I’m going to say no to. Pretty much. Jack Butala: That’s true of everything. Jill Dewit: It’s just got to be the right … Uh oh. Jack Butala: You know people have Indian name like Dances with Wolves? Jack Butala: Jill’s name is can’t say no. Jill Dewit: It’s true. Wow. Seth Williams: It’s like [Inaudible 22:09]. Jill Dewit: We could take a lot of different ways relating to business [inaudible 00:22:17] over the properties and you know what Seth? I’m not afraid of any state at all. Even if I don’t know the state, for me that’s going to challenge to, I’m going to figure this out. There are states and deals that we’ve had to get attorneys involved because it has to be done a certain way and blah blah. Not afraid of it all. If it’s a good enough deal, I’m going to make it happen. I’ll figure it out. Seth Williams: That’s really true. Jack Butala: I love acreage, west in Mississippi. When I say acreage, I mean five acres or more. Then usually we try to cap it off at forty acres, although Jill’s works on, she’s working on some huge ranches in Texas right now. Those are great cash deals, some of them terms but Northern Michigan is always something I’m like, next week I’m going to do that, and it just never happens. We’ve done a ton of great terms transactions all throughout Northern Michigan. For whatever reason, everybody loves to I think vacation up there, from Chicago, and everywhere else, in Detroit. Seth Williams: Getting [inaudible 23:22] pretty easy to sell for the most part. There is just a lot of kind of natural beauty in that part of the country. It’s not hard to make those look good to people. Jack Butala: That’s great that you bring up sales. that’s my next question. Is there some magic to how sell property? Do you find it challenging? What’s been your general experience with sales this day and age? Seth Williams: Honestly there’s probably plenty of things I could do better. The process I’m typically going through is just putting a reasonable amount of effort into creating a good listing, with good pictures, and a good description and a good headline, and all that. Then put it in places like Postlets, and at least a few different markets in Craigslist just to make sure it’s getting in front of as many different eyeballs as possible. I have Backpage and that kind of thing too but that’s all really I have ever done. I have enlisted realtors I think twice ever, and in both of those cases I was able to sell my land before the realtor was. In one of those cases, I had to pay this realtor a commission just because I had signed a thing with them even though I did all the work, and that was like, I’m never doing that again. Jack Butala: It’s an exclusive agreement? Seth Williams: Yeah. You would think that a realtor, like that’s all they do. You’d think they would be able to do it faster than me, but I don’t know if it is just because I care more or what, that I work hard to get those things sold and it usually doesn’t take long and it’s not that hard. Jill Dewit: Don’t you find too, for me when people are calling me about properties, they are really happy to know that I’m not a realtor and I am the owner and I get to make the decision? They are like, It’s nice. Then we can negotiate right there. It really helps. Seth Williams: That’s a huge deal when it comes to seller financing, that kind of thing because there is all kinds of things. You can be like, if that’s not affordable, why don’t we change the rate, or the down payment? It’s like, you can just make those decisions on the fly. It’s very nice. Jack Butala: That’s the definition of a private investor where you’re not really reporting to anybody. We’re not knocking real estate agents. It’s just that the whole thing is set up different. It’s set up to, every education experience that I’ve been exposed to when it comes to being a good successful real estate agent, they all center around getting a ton of listings, playing the numbers game, and then relying on buy side agents or brokers to sell the property for you. Really what you’re doing is getting up in the morning and getting more listings. It’s counter intuitive from a client servicing perspective. Then the other point too is that the higher dollar amount that the listing is the more the commission is. The product that we sell is usually not that high dollar amount. I just don’t think there’s a lot of motivation. Seth Williams: I’ve found the same thing. One of the properties I was trying to sell was eight thousand bucks or somewhere in that range. Yeah. Just like you said, it’s just not that big of a deal to whom it’s not at the forefront of their priority list. In a way you can’t blame them. Jill Dewit: I know, What’s the commission on eight thousand? Jack Butala: I think it’s eight hundred bucks. Jack Butala: Yeah. At ten percent it’s eight hundred dollars and then everybody starts splitting it from there. Jill Dewit: Right. Then it’s no good. If it were me I wouldn’t take it. Yep. Jack Butala: They probably just like Seth. That’s what happened. Jack Butala: What’s the secret sauce? What’s it take to get where you are? You obviously made it through the downturn. You started it before that. What’s the special deal about you? Seth Williams: I don’t know. It’s not like my life is perfect or anything. It’s really just, I would say, some element of focus. When i started I knew a handful of other people who were getting started as well and only one of those people is still doing the same business. A lot of them just got sidetracked with other stuff and are just on other things and they found out, this actually take a teaspoon full of work and I’m not one [crosstalk 00:27:38]. Just being willing to stick with it. One of the reasons i stuck with it was, like back when I was in college and just out of college I tried all kinds of random business things. They were all very challenging and very hard and I was realizing, it’s not easy to make money in this world. When I found this and the opportunity it was so clear cut and when I tried it and it worked so well, I was like, this is amazing. This is something really special and I’ve got to stick with this because it’s not everyday that you come across this kind of opportunity. I think maybe just realizing how special it is maybe. Jack Butala: I’ve been asking people for years to show me a better business model. We make a year over year annual return on about fifty percent on the terms deals that we do. If we pay four thousand dollars for a piece of property and we collect in payments, these are terms deals, over two thousand dollars, that’s about a fifty percent return. It’s secured by real estate that I own free and clear and it doesn’t cost me anything to keep it running like a rental house. I’d love to see a better business model than that. It’s on auto pay. Everybody pays. It’s a fun [inaudible 00:29:02]. Jack Butala: If anybody who’s listening has a better business model than what I just described I would love to know about it. Seth Williams: Yeah. Me too. Let me know if you find out about it because I want to know. Jill Dewit: Hey, Steve. I got to tell you. We just started this thing, Seth, with our new revamped show here and one of the things is we title it at the end. I’ve already got the title and I’m not going to tell you guys until the end, because I just wrote down what I think is a awesome title for this podcast. It’s funny. Jack Butala: Is it can’t say no? Jill Dewit: No, it’s not can’t say no. It’s the best quote. Jill Dewit: I’m not going to tell you until the end. Jack Butala: Last question. For somebody who’s starting out what would you suggest Seth? Seth Williams: I get that question from time to time. Something I’ve actually hear from quite a few people is, I have no money. I’ve got like fifty dollars. What can I do to get started? Maybe you guys know of a different way but personally when I got started I had at least a few thousand bucks to work with, something where I could do direct mail campaign, lock up a first property, buy it, sell it, and still stay afloat. I would say, just as far as I know, I would say if you have no money, save up just a little bit. Maybe three-ish thousand bucks. That was what I had. If you got nothing maybe just hang on for a few months is you can, and then just get started with the direct mailing campaign. Make sure you’re getting the best quality data and you’re filtering that to the extent that, I guess, the furthest you possibility can. I remember my first few lists, I spent hours and hours going through that process. Especially when you haven’t been through the whole process yet, and you’re like, is this really worth it? This is just nuts. When I finally did it and sent them out and the results came in it was like, oh my goodness. It is so worth the trouble to do that and just to have faith in the process and just give it one solid try doing everything right and it’s going to work out. You just have to make sure you’re following the right process and doing everything. Jack Butala: The last time that you and I spoke I remember how you’d answered that question and it always stuck with me, you just can’t give up. Jack Butala: It’s almost not so much a matter of the money piece it’s just whatever obstacle you come across just keep moving forward. Seth Williams: I have talked to some people who they’ve maybe done a direct mail campaign and something went wrong and they, I don’t know, got the list from the wrong place or something didn’t happen right. I do understand people who have done it and it just didn’t go well and they’re like, I can’t keep doing this. At some point you need to see some results to keep faith in the process but that just goes back to the first point of, just do it right to begin with. Don’t mess around. Just do the formula that works and it’s going to be fine. Jack Butala: At [inaudible 00:32:10] I spent several in video talking about our direct mail process and it’s the same, where we get our data it’s been made very consistent so no matter where you do this, it’s very scalable. Anywhere in the country the data’s the same. It’s from the same source. It’s from First American Title. Then I very clearly walk step by step about how to send a mailer out. We just had two people on the show. The shows haven’t aired yet. Two members. Two Land Academy members. They both have an initial response on the first mailing that they’ve sent out, of more than twenty-five percent. Jack Butala: That’s for every hundred mailers you send out, they’ve received twenty five people calling back saying they’re interested. Seth Williams: No, that does not happen without doing something very right. Whatever you’re teaching it’s working. Jack Butala: I think the first step in all of this is getting educated. I’m saying tens of thousands of dollars getting educated, I’m just saying, I think one of the biggest mistakes people make in any real estate, starting a real estate career is going out and getting a deal and then asking everybody is I should do the deal. I think you’ve got to get organized and get that data mindset where it needs to be and then start looking at some deals. Get educated. Jack Butala: What do you think can’t say no? Jill Dewit: Thanks a lot. That’s not the title. He’s done that to me too. Oh, my gosh, talk about throwing somebody under the bus. Seth Williams: Is Steve just that guy? Jack Butala: It’s mutual. It’s just Jill’s turn at the barrel today. You know what? This is what I said to my staff three days ago. I said, Jill thinks that my grammar and my writing skill is at about the third to fourth so I’m just all letting you know that before you edit my stuff and look at it that’s about where she thinks it is. You know what the staff said? It’s more like the sixth or seventh grade level. Now I’m in that box. Seth Williams: That’s quite the compliment. Jack Butala: I’m a seventh grade level writer. Seth Williams: I’ve actually heard that’s the best level to write at because that’s what the average person in society reads or understands and thinks in that level. Of course there’s people out there who are more advanced than that but even they can understand that level as well. It applies to everybody. Seth Williams: There’s nothing wrong with that. Jack Butala: I spelled grammar wrong and that’s how it all started. Jill Dewit: It did. It was the funniest thing. I got to tell you. Could you just edit this for my grammar and the employee looked at me and said, what do I do with that? I said, I’m not going to touch it. You do what you want with it. I am not going to touch it. Jack Butala: Seth, it was wonderful having you on the show. What’s coming up? Give us a taste of what’s happening that’s new with REtipster and what’s fresh. Your blogs are always so fresh and detailed. Is there anything new coming up? Seth Williams: Thanks. Really, 2015 has been just a crazy years for me. It’s probably been the busiest year of my life. I feel like I keep saying that and thinking it’s going to get better and it never does. 2015, I’m really just trying to get through this year with my head still on without going nuts but I’ve got a few good blog posts coming up. I’ve got one that I’m working right, about perc testing. I spent about ten or twelve hours on that. Do you guys every do a perc test. Is that something you ever encounter? Jack Butala: No. I know exactly what you’re talking about and in the desert which is where we do the vast majority of the transactions, it just doesn’t, I’m from Michigan by the way, but it’s just not as pertinent as it used to be. Seth Williams: Less of an issue out there? Seth Williams: In Michigan I’ve run into it several times. Just cause it’s all about, in order to put a septic system there the soil has to perc which means basically the water has to drain through it at a certain rate or a septic system won’t work there. Which means you can’t build there which can sabotage the value of a property. Basically, for those who do encounter that issue I’m trying to explain what is a perc test. How do you find out as inexpensively and as quickly as possible whether a property percs or not. That’s one thing I’ve been working on this past weekend. Seth Williams: Yeah. Go ahead. Jack Butala: That question comes up for us and this is how I answer it. There are so many alternative ways to deal with water and waste management in this day and age, all you got to do is go on Google and look for alternative to septic. I get a lot of blind phone calls from sales people. A few years ago I got on a list, somehow. I didn’t do it on purpose, about these systems and it’s amazing, for a small amount of money what you can do to improve property that actually exist on it. Seth Williams: I’m actually learning, it has to lot to do with the health department in every county. That’s who governs what’s allowed in terms of septic systems. You’re certainly right. There’s a lot of alternative ways you can usually solve that problem if you run into it. Jill Dewit: I have an easy way to solve that problem. Move on to another property. Seth Williams: That is the easy way. Jack Butala: Jill just said no. Jill Dewit: I didn’t say no. I said, I’m going to say yes over here and let that one go. Jack Butala: Jill, it’s time. Tell us what the title is we’ll pipe into. Jill Dewit: I love it. A teaspoon full of work. Guys. Seth Williams: That was easy enough. Right? Jack Butala: Oh, my gosh. That is so the title. You’re exactly right. Jill Dewit: Yeah. How to do this with a something, a teaspoon full of work by Seth. It’s awesome. Seth Williams: I like it. Seth Williams: Let’s see if it works. Jack Butala: Seth, it’s great to have you on the show as always. Before we started Jill and I said, this could work out to be, because our models are so similar, it could work out to have you on as a regular guest we’d love to do that. Seth Williams: Yeah. That’d be cool. I’d like to be back in at some point. It’d be awesome. Jack Butala: I know it’s Sunday too and thank you. Seth Williams: Yeah. No problem. Thanks for having me on and appreciate talking to your guys and best of luck to you in your business. Jack Butala: Thank you. We’ll talk to you soon. Seth Williams: Sounds good. See you. Jill Dewit: That was so much fun. Jack Butala: It really is such a treat to speak with him and I mean that from my heart. He has just weathered the storm and he sells himself short a little bit, I think, but what a talented guy and just nothing negative to say at all about him. Jill Dewit: As I’m hanging up, I’m like, I need to promote him a little bit more. He’s a really good. Let me back up. It’s a teaspoon full of work by Seth Williams. We need to get that out there. It’s not just Seth. It’s Seth Williams and he is really great at what he does. Getting to where he is, this level, and his knowledge and what he does and his following and his writing. He’s got a great fan base all while having his regular daytime full time job and family and a life. It’s pretty impressive. He takes on some stuff. That stupid, the perc test thing. Oh, my God. That’s a project. Jack Butala: He sends a lot of referrals to us from Land Academy referrals, people who are interested in getting in the business and he sends them to us because we can take it a little further, I think, than he has it from an education stand point. They all have some version of this to say. If I only absorb ten or twenty percent of what this guy really talks about, in depth, I feel like I’m really winning. I’m ahead. He’s very brainy and takes that almost engineering approach to this business which I really appreciate. Jill Dewit: I love it. You know what the big picture is? Happy to promote him, I’m sure he’s happy to promote us. There’s enough land to go around. We’re all going to be just fine. We can all work together and all do very well. Jack Butala: A teaspoon full of effort. Is that what It is called? Jill Dewit: A teaspoon full of work. I thought it was the best thing ever. I’m like, I’ve got to write that down. When he talked about getting into this business and watching his friends that’s what I took from it, and this and that and then he said, when I started to do it and test it, I’m like, it takes a teaspoon full of work. This is the greatest thing ever. Jill Dewit: I loved that. That was super fun. Jack Butala: I thanked him because it is Sunday, and I’m thanking you. There’s lots of other stuff that we all could be doing, especially at this point in our career, all silliness aside, there’s a lot of things we could be doing on a Sunday Jill and thank you for taking the time to do this. Jill Dewit: You’re welcome, for saying that. I appreciate it. Jack Butala: Talk to you soon. Jill Dewit: Let’s go buy some real estate. Jack Butala: Yeah. That’s it. Not now on a Sunday, but yes. Jack Butala: Join us on the next episode when Jill shows us how she doubled her money in fourteen days. If you have a question about how to buy property super cheap and sell it for more, then let us know, at 888-735-5045. Jill and I’ll try to give you a message on the air. Every single month we give away a property for free. No strings. No funny business. It’s super simple to qualify. Two simple steps. Leave us your feedback for this podcast on iTunes and number two, get the free ebook at landacademy.com, you don’t have to read it. Now go buy some property.